The Jefferson Cup Committee is pleased to announce their selections for the 2018 winning and honor titles. 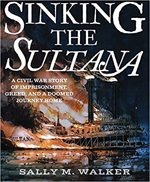 The 2018 Jefferson Cup Award winner for Young Adult Readers is Sinking the Sultana: a Civil War story of imprisonment, greed, and a doomed journey home by Sally M. Walker. The 2018 Jefferson Cup Award winner for Young Readers is Before she was Harriet by Lesa Cline-Ransome. In Sinking the Sultana (Candlewick Press), Sally M. Walker immerses the reader in the lives of five Union Civil War sold iers and their journey home on the Sultana, a steamboat that was overcrowded and had faulty equipment. Walker introduces readers to the five men, the ship’s captain, and the rescue efforts and tries to answer the question of where to lay blame for the fire. With a vast array of historical documents, including diaries, newspapers, and pictures, Walker brings the reader close to the action to get inside the maritime disaster that was the Sultana. 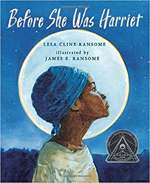 Before she was Harriet (Holiday House) by Lesa Cline-Ransome engages the reader in the life of Harriet Tubman, detailing the many important roles she played using lyrical verse and immersive watercolors to showcase each phase of her prolific life. The illustrations transport young readers to each time and place, emphasizing that continuation of racism as she rides on a segregated train. Undefeated: Jim Thorpe and the Carlisle Indian School football team (Roaring Brook Press) by Steve Sheinkin and Locked up for freedom: Civil Rights protesters at the Lessburg Stockade (Millbrook Press) by Heather E. Schwartz were chosen as honor books for young adult readers. Schomburg: the man who built a library (Candlewick Press) by Carole Boston Weatherford and The many reflections of Miss Jane Deming (Atheneum Books) by J. Anderson Coats were chosen as honor books for young readers.